How do I know when it’s “time”? It’s a huge responsibility, the decision to euthanize (or to not). Euthanasia is also a topic that, when I was a new pet owner, I spent zero time thinking about. “My dog is young, why worry about something that may or may not come up years from now?” It’s painful to think about life without your pet. But here’s the thing: you owe it to your pet, and to yourself, to think long and hard about this one now. Making the “right” decision isn’t easy; it’s different for each person, each pet, and each circumstance. The process can vary by vet, although my experience has always been the same. One shot is given to calm your pet, and make them very sleepy. This also gives the owner a chance to say goodbye without their heightened emotions causing stress for the pet. The second injection is then given, and it stops their heart almost instantaneously. It’s not painful for them, it really does appear that they are going to sleep. I have lost 5 pets in my life (not counting childhood family pets). Each experience was different, every loss was painful. Sasha: our very first loss. 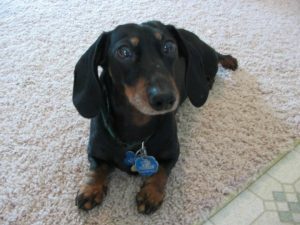 Sasha was a 12-year-old miniature dachshund. She was a spitfire, a gift to me from my husband on the morning of our wedding day. Sasha developed seizures and passed away unexpectedly at the ER vet (they had her stabilized and were simply monitoring overnight). She died alone in her kennel, and that was a horrifically painful experience for me. I vowed I would never again let one of my pets die alone. 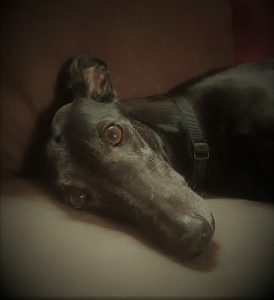 Cosmo, our second loss, a mere 6 months later. Cosmo was another 12-year-old dachshund. He died from complications from pancreatitis, which we first mis-diagnosed as a back issue. We fought long and hard to keep him alive. In hindsight, we waited too long to put him down; I put him through several days of misery at the vet that I shouldn’t have. To this day, I carry guilt with me about how he suffered. I am grateful that I was there with him when he passed, to tell him how much I loved him, and how sorry I was that we put him through all that misery. In early 2017, our third loss: Boo. 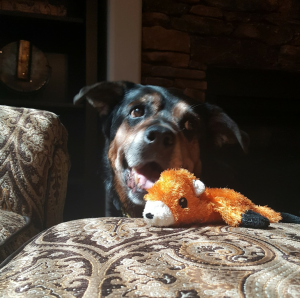 Boo was a senior (12-ish) Rottweiler/shepherd mix. We joked about her being an “accidental adoption;” we adopted her from the shelter at 12 years old, knowing we were really acting as hospice care for her. She had an amazing year with us, full of love and adventures. Boo eventually started to slow down: not eating consistently, sleeping more, fatty masses or tumors started growing larger, quickly. We made the decision to have her euthanized, at home in her favorite spot, before she didn’t have a quality of life anymore. That day, I brought home 4 cheeseburgers and a large french fry for her. Oh, the joy! She ate it all and loved it. It was oddly peaceful for me, being able to watch this terminally ill dog still live in the moment and enjoy a simple pleasure. We then settled Boo down into a blanket in “her spot”, in the front outside our house, smelling all the good smells and hearing all the good sounds. I was able to lay with her and pet her, keep her calm and tell her how much I loved her. I am so grateful for Topaz Veterinary Clinic for making that house call and the compassion they showed, allowing us as long as we needed with her after she died. … and not even 8 weeks later, our fourth loss, Lotus. 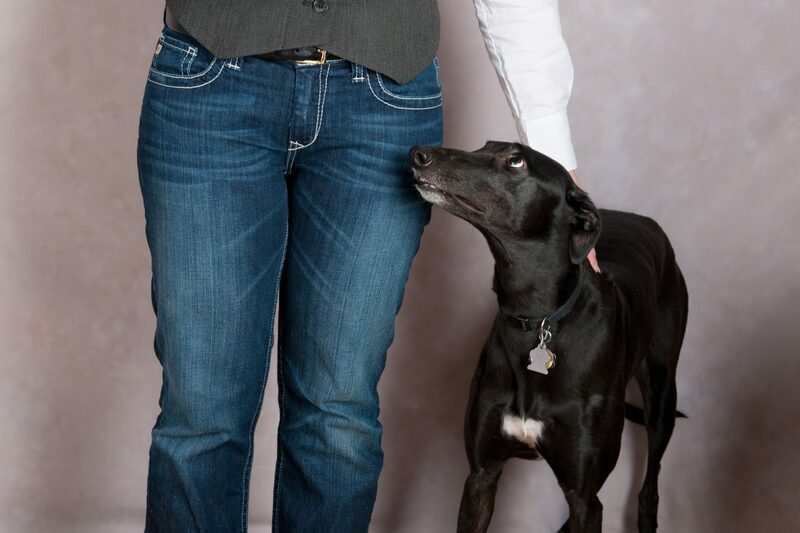 Lotus was a 7-year-old retired racing greyhound. Early one morning, she went from being just fine to barely being able to walk, just like that. We rushed her to the emergency vet, to find out she had blood pooling in the sac around her heart. The vet was able to stabilize her by drawing the blood off but advised us it would certainly happen again. Maybe in an hour, maybe a day, maybe a week. The (highly) likely underlying cause for this was a cancer of the blood (hemangiosarcoma). We were left with two options: take her home and hope to have time for a second opinion, diagnosis and treatment plan, or euthanize her there. We decided it was the best thing for Lotus to euthanize her there, and we could be with her to make her calm and comfortable. We were able to find a nice patch of grass in a quiet area outside the parking lot of the emergency vet. While I was heartbroken to lose her and so angry that she went so soon, I am so glad I was able to be there with her. In early 2018, our fifth loss: Roxy. 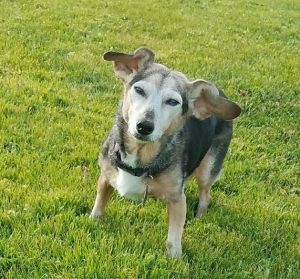 Roxy was a 15-year-old dachshund/rat terrier mix. Roxy was the first dog I had as an adult, we bought her as a puppy from a pet store (and boy did she have the health issues to go along with that!). Roxy had been going downhill for about 3 years. She no longer consistently went potty in her litter box. She lost her hearing and most of her sight. She didn’t want to interact with the other dogs. We were keeping a close eye on her, but the thing was – she was still just so darned happy. She would get bouncy like a puppy when it was time to eat, and she even was still playful from time to time. We woke up on Tuesday last week to discover Roxy had had a stroke. She couldn’t walk very well, kept falling to one side. It was time. We gave her a last delicious meal of off-limits food (she was on restricted diet her whole life due to her poor breeding) and let her roam the grass outside. We then took her to our vet and were with her as she was put to sleep. Although I lost Sasha and Cosmo 8 years ago, I still feel incredible guilt about how they passed. Sasha was alone and likely scared. Cosmo went through a lot of pain and suffering, without his people with him, until we put him down. I wasn’t prepared for the loss of either of them, and they suffered because of that. As heartbreaking as it has been to lose Boo, Lotus and Roxy (all within the past year), I can at least say I am at peace with my decisions. I miss them terribly, but I know that I did the right thing for them, and that brings me comfort. I’ve learned that the key to this decision, for me at least, is driven by quality of life and peace and calm when they pass. How will treatment & recovery of this ailment affect their quality of life? Can I financially and emotionally commit to this treatment and recovery plan? What are the odds of successful treatment and what is the expectation for time of life remaining? Is my pet telling me that they are ready (not eating, not taking joy in favorite activities)? Do you hire a vet for a house call vs. bring your pet to the vet office (some vets make house calls as well, it’s worth asking about)? Do you want their remains returned to you? You have the option for either individual or group cremation. What do you want to do with their remains / how do you want to honor their life? Remember to reach out to your support group. Talk to people who understand your love of your pets. New to the area, or don’t have a local support that understands? Come to the shop, talk with us. We get it. 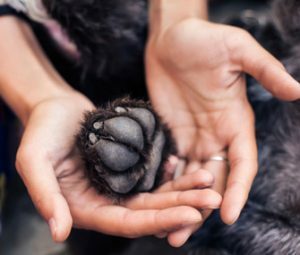 Volunteer your time at a local animal rescue (our friends at Follow Your Heart Animal Rescue can always use more volunteers!). This advice is based on my experience as an animal lover and advocate. As always, when contemplating any medical decision for your pet, please consult your veterinarian. Proud Mama of Syd, Ellie, Sassy & Calypso. Well written, thoughtful, humane and shows your love. I’ve been thinking about getting another pet, but I want to be prepared for the time I made need to have them euthanized. Thanks for pointing out that you should take into consideration whether or not you can afford to try treating them, both financially and emotionally. What are some ways one can help themselves realize that euthanasia is a humane option and not murder?That’s something I have a hard time with, so I’d like some advice.